Think of embroideries and prints, the first name that comes to our minds is Surat. The textile market in Surat is considered as one of the best in terms of embroideries, prints and so on. The market offers outfits manufactured in the textile industry in Surat. The textile industry is engaged in the production of yarn, weaving, and embroidery. With a plethora of embroidered sarees, the textile market of Surat is one of the most sought-after destinations for buying ethnic wear especially for weddings and religious events. The textile market showcases embroidered sarees and drapes with beautiful prints and designs. The embroidery of these sarees and the much loved Zari work are manually done by the skilled artists of Surat. The products manufactured in the textile market are exported globally. Did you know – There are computerized machines meant for replicating designs on the ethnic drapes which have reduced the cost of production of the outfits. Wish to buy outfits manufactured in Surat? Well, we have partnered with manufacturers from Surat's textile market to bring to you a wide range of sarees from Surat. The best part, we will have it delivered to your doorstep. Have a look at these amazingly designed saree styles manufactured in the textile market of Surat. It’s summer! The trick is to keep it stylish by opting for minimal prints. We recommend you pick one of these sarees with subtle prints or browse through our entire range of printed sarees. 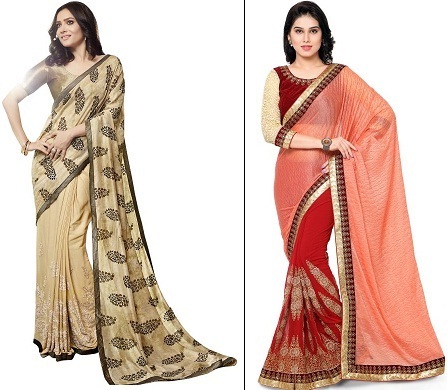 Look super stunning as you wear a heavily embroidered saree. The intricate embroidery of these sarees is to die for! You can wear an embroidered saree at both weddings and formal events as it is a mix of elegance and sophistication.